Mega Moolah: The Most Popular Progressive Slot in the World Mega Moolah is one of the original progressive slots that first took the casino industry by storm in 2006. Mega Moolah is a Microgaming slot, as if we know anything at all about Microgaming – then we can all agree that Microgaming know their casino business and were the first company to produce online slot, and today, still produce the best online slots you can play. If you are hunting large online jackpots, then you need to look out for online progressive jackpot slots. 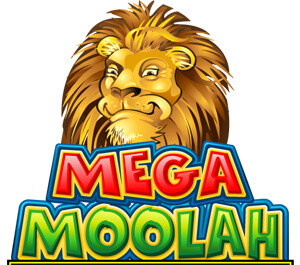 Mega Moolah is one of them and often boasts a multimillion jackpot. If you’re wondering how the jackpots can grow so large and a single casino offers such amounts of money, then let us explain a little bit more of the workings behind the jackpot system. Progressive jackpots work in the sense the huge jackpot is pooled together by all of the online casinos who offer the progressive slot mega Moolah. If you can imagine, every player who spins a spin on mega Moolah, actively contributes to the prize pool, then it’s no wonder that over some amount of time, usually can be between 4-16 weeks, the jackpot grows to be well over £4 Million! 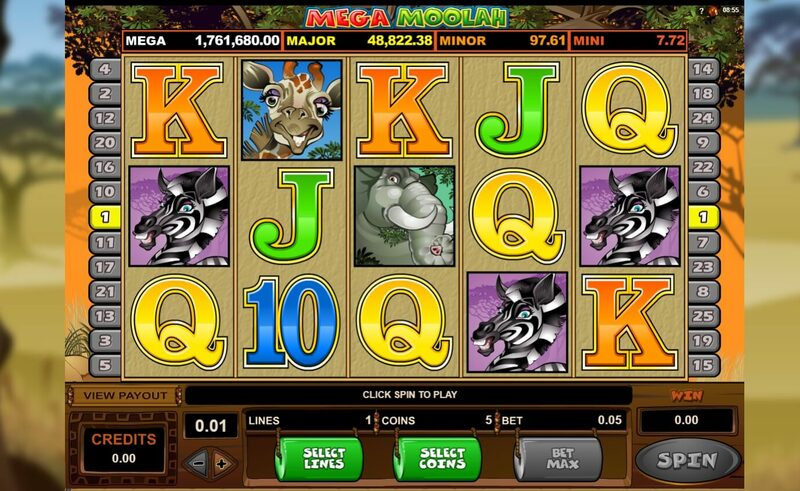 Mega Moolah is designed with a distinctive African safari theme. It reminds us of Disneys The Lion King the graphics are great looking, you’ll learn to love all the animal characters who try and help you win your way to millions. The symbols you’ll see on the reels are Elephant, Buffalo, Giraffe, Zebra, Kudu, Ace, King, Queen, Jack and a Ten. So, without further ado – let’s get started! Mega Moolah is an online slot which is designed with 25 pay lines, 5 reels and three rows. Load the slot and choose the bet levels which most comfortable for you. The coin range from 0.01 - 0.05 with the min bet 0.25 and the maximum being 6.25. Mega Moolah has a couple of features to keep you entertained while you’re waiting for that ever important bonus round wheel of fortune to pop up, this is what you’ll need, but we’ll explain that in just a moment. Wild Symbols: Mega Moolah slot has wild symbols which you’ll recognise as they look like Wild Lion. The wild symbol in Mega Moolah substitutes all the symbols except the scatter monkey. Free Spins Round: This is a welcome addition to help you play for as long a possible and win more tokens as you go along. Get 3 or more fortune telling wise monkeys and you’ll activate 15 free spins, with a nice added touch that all your wins will be tripled! If you don't win the jackpot from one of these bonus rounds, then again, these free spins will help you top up your casino bankroll and play for longer for more chances for that lucrative jackpot round to rear its head again. The Jackpot round can pop up at any time and where in the bonus rounds and it’s totally random, but highrollers will be pleased to know that it does indeed help if you’re playing higher bets. The higher the bet, the higher the chances are of winning the jackpot. Mega Moolah is a terrific Mobile Jackpot Slot that has everything you need 4 in one jackpots, great graphics, hilariously fitting soundtrack, Wilds, Free Spins.. need we have to remind you again that there's Jackpots galore? The great thing about Mega Moolah Slot is that it’s a timeless slot and you don’t have to win the progressive mega jackpot to take home some life changing wins, as the 3 other local jackpots would do quite nicely as well. Mega Moolah maybe seen as a little dated to some newer slots that’s have been released more recently. Such as Mega Fortune Dreams or Cosmic Fortune, but sometimes we like to stick to timeless classic slots as they work and do what you want them to: Mega Moolah has what’s considered a volatility edge, so designed to give you enough smaller wins throughout your time playing it, to help you keep playing for as long and as profitable as possible. Where To Play Mega Moolah Slot?